6 5 4 3 2 1 SHIPPING & RECEIVINGThe “Receiving” section of ForecastRx is for customers who use Amazon Seller Central as their primary data source. Here, you have the ability to keep track of shipments Amazon has received and reconcile those inbound shipment quantities against your purchase orders and warehouse inventory. PURCHASINGThe “Purchasing” section of ForecastRx is where you can access automatically-created Suggested Purchase Orders based on your latest forecast results, your Custom PO Workspace and Saved POs you built using our app. 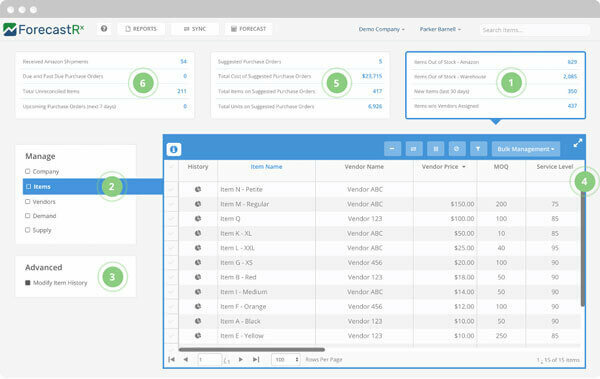 ADJUSTABLE WORKSPACECustomizable grids allow you to View, Modify and Bulk Manage certain settings and ordering parameters. DATA MODIFICATION METHODSOnce your target item is in view, choose between these data modification techniques based on your needs:a) Manual Override - This function allows you to attenuate previous sales anomalies that could negatively impact the accuracy of projections, like stock outs or one-off promotions.b) Copy History - This gives you the ability to leverage existing data from legacy products to help with a new product launch. c) Backfill - Backfill provides a way to enhance seasonality trend recognition for items with less than the normally-required 24 months of sales history. MODIFY SALES HISTORYForecastRx offers three unique ways to modify your existing historical sales data in order to improve your future forecasting performance. Popular reasons for modifying sales history is to adjust for stock outs, promotions or other identified anomalies as well as leveraging past sales history of a phase out item for it’s replacement. 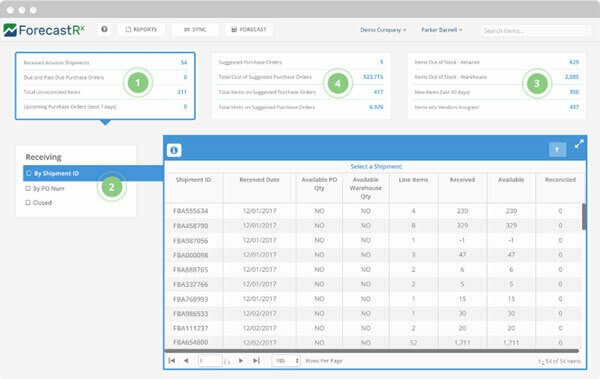 DATA MANAGEMENTThe “Manage” section of ForecastRx allows you to modify your forecasting inputs and specific ordering parameters. 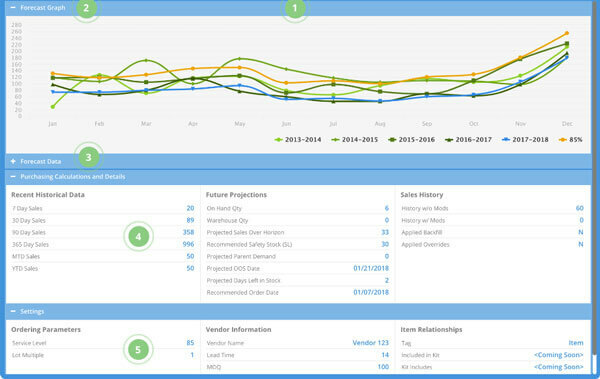 You can augment and adjust sales data, customize your company, item & vendor settings, and much more to help us deliver the most accurate demand forecasts and purchasing recommendations. 6 5 4 3 2 1 1. DATA MANAGEMENTThe “Manage” section of ForecastRx allows you to modify your forecasting inputs and specific ordering parameters. 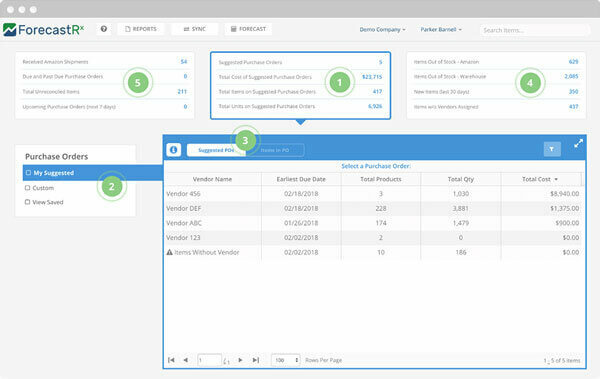 You can augment and adjust sales data, customize your company, item & vendor settings, and much more to help us deliver the most accurate demand forecasts and purchasing recommendations.2. MODIFY SALES HISTORYForecastRx offers three unique ways to modify your existing historical sales data in order to improve your future forecasting performance. Popular reasons for modifying sales history is to adjust for stock outs, promotions or other identified anomalies as well as leveraging past sales history of a phase out item for it’s replacement.3. DATA MODIFICATION METHODSOnce your target item is in view, choose between these data modification techniques based on your needs:a) Manual Override - This function allows you to attenuate previous sales anomalies that could negatively impact the accuracy of projections, like stock outs or one-off promotions.b) Copy History - This gives you the ability to leverage existing data from legacy products to help with a new product launch. c) Backfill - Backfill provides a way to enhance seasonality trend recognition for items with less than the normally-required 24 months of sales history.4. ADJUSTABLE WORKSPACECustomizable grids allow you to View, Modify and Bulk Manage certain settings and ordering parameters.5. PURCHASINGThe “Purchasing” section of ForecastRx is where you can access automatically-created Suggested Purchase Orders based on your latest forecast results, your Custom PO Workspace and Saved POs you built using our app.6. SHIPPING & RECEIVINGThe “Receiving” section of ForecastRx is for customers who use Amazon Seller Central as their primary data source. Here, you have the ability to keep track of shipments Amazon has received and reconcile those inbound shipment quantities against your purchase orders and warehouse inventory.